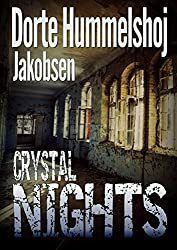 I recently read Crystal Nights: a Scandinavian mystery by Dorte Hummelshoj Jakobsen, who kindly sent me an e-version of the ARC of her book. The Danish edition of the book, KrystalnÃ¦tter, won a national competition in 2013. Once I started reading Crystal Nights I was hooked. It begins with an extract from Hans Christian Andersen’s The Snow Queen, a fairy tale about the struggle between good and evil, when a magic mirror was smashed into many pieces, which then entered the eyes, hearts and minds of people infecting them with evil. Crystal Nights moves between events in Germany in 1938 to Kalum, a fictional village in Denmark, in the 1960s. In Berlin in 1938 Jewish families, including the Stein family, Simon, his wife Sara, and Miriam and Isaac, their two young children flee from the events of Krystallnacht, the “night of broken glass”. Their journey doesn’t get them to safety though and ends with Sara desperate as her son becomes dangerously ill and Simon refuses to get medical help. Moving on to the 1960s in Kalum, the story divides into the years 1963 and 1967. In 1963 a middle-aged smallholder from Brook Farm, north of Kalum is killed in a road accident. The relevance of this death only becomes apparent towards the end of the book. In 1967 a young boy, Lars-Ole disappears. His mother believes he had gone to stay with his father, but eventually everybody except for his friend Niels, assumes he is dead although his body has not been found. Niels finds Lars-Ole’s notebook, in which he had written some coded messages and sets out to discover what has happened to him, putting himself into great danger. I particularly liked the comparison between Andersen’s fairy tale and the events of Krystallnicht and I think the characters of both Lars-Ole and Niels are well-drawn, with the village setting in the 1960s particularly convincing. I was carried away by the story, a story of how evil touched so many lives with such terrible consequences and how by patience and perseverance the truth was revealed. You can see photos and maps showing the area in this picture companion to the book. So very glad to hear you liked this one, Margaret! Isn’t it great? i think Dorte has quite a lot of talent. This sounds like a fascinating mystery and I love the connection with The Snow Queen fairy tale.